Rachel Storey’s Palace of Memories is a brief, fascinating three-part documentary about Barrangal Dyara (Skin and Bones), a massive art project by Aboriginal artist Jonathan Jones that sought positive ways to close the gaps in Australia’s collective memory of history, both Indigenous and non-indigenous. 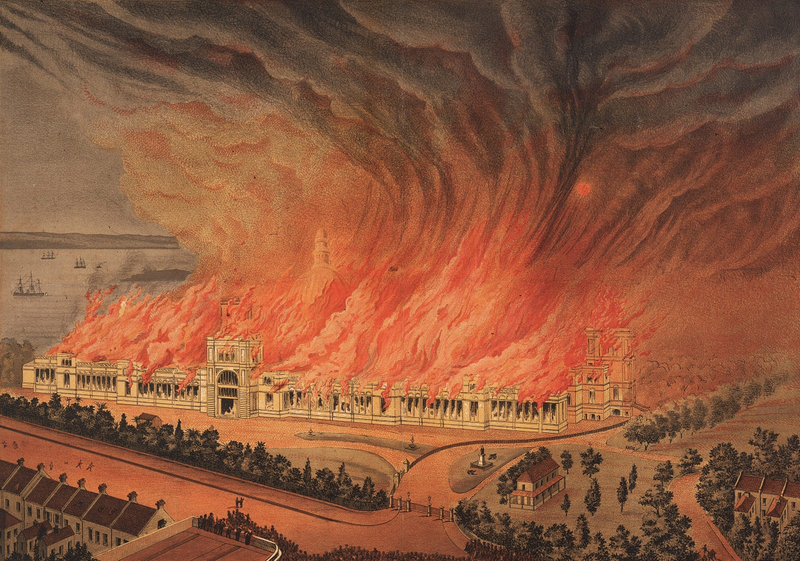 Presented by Kaldor Public Art Projects this year, the installation Barrangal Dyara resurrected the forgotten history of colonial Australia’s most astounding architectural achievement: the massive Garden Palace for the Sydney International Exhibition in 1879. Commissioned by Sir Henry Parkes, the “Father of Federation,” the Garden Palace was heralded as something that would put Sydney on the world map. It housed government documents, census data and convict records, as well as huge exhibits from museum collections, including the earliest colonial acquisitions of Indigenous artefacts. Within three years it burnt to the ground under mysterious circumstances, and in a remarkably short period it vanished from the colony’s collective memory taking with it records, aspects of which have been otherwise erased and denied since Federation. But this is not the angle explored by either Jones’ art project or Storey’s ABC documentary. Both offer a gentle, reconciling journey of nostalgia for Australia’s forgotten places and cultural achievements. 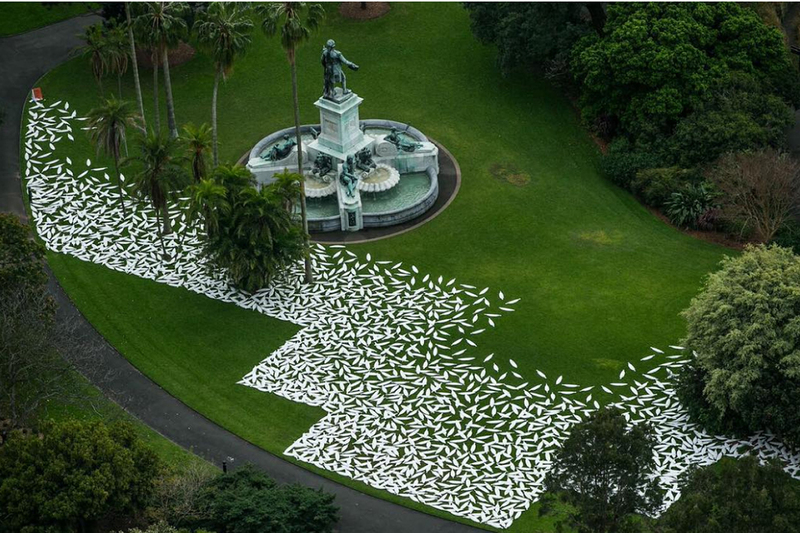 Jones honoured the architectural achievement of the Garden Palace by placing thousands of gypsum replicas of Aboriginal shields where the enormous building’s foundations once lay in Sydney’s Botanic Gardens. In doing so, he also dignified the earliest collections of Aboriginal material culture destroyed by the fire — the very first artefact acquired by Captain Cook in Australia was a shield. However, Jones subtly challenged the ‘primitive savage’ stereotypes that informed those first collections, which wrongly perceived such cultural items as shields as mere weaponry and framed Aboriginal people as violent, placeless nomads with only a rudimentary culture and society. Jones’ installation emphasised the shield’s ceremonial purpose. 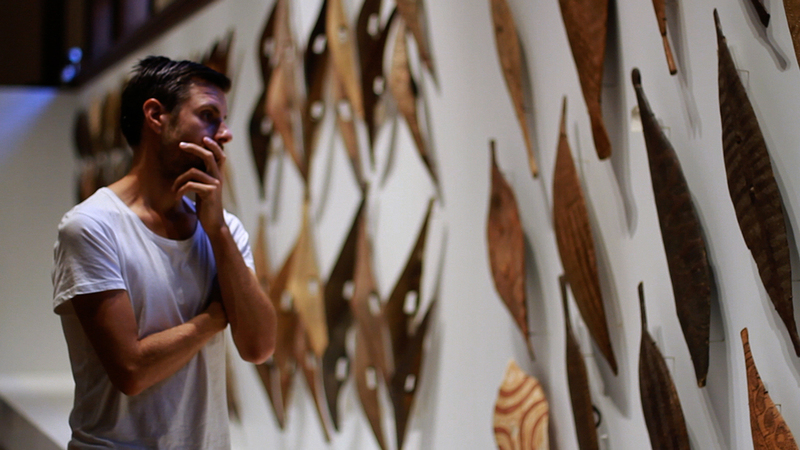 He invited Bangarra Dance Company to perform onsite and installed soundscapes of Indigenous languages and audio of a traditional grinding stone rather than the ubiquitous didgeridoo, illuminating the little-known fact that our First Nations peoples were grinding flour for bread tens of thousands of years before the Egyptians. Then came the installation’s centrepiece — kangaroo grass beds placed at the site of the old building’s dome, which originally housed a statue of Queen Victoria. Kangaroo grass was the native wheat planted and harvested for thousands of years in Australia — another forgotten piece of history revealed in this documentary by Bruce Pascoe, author of the definitive work on this topic in his book Dark Emu: Black Seeds, Agriculture or Accident? (Magabala Books, 2014). 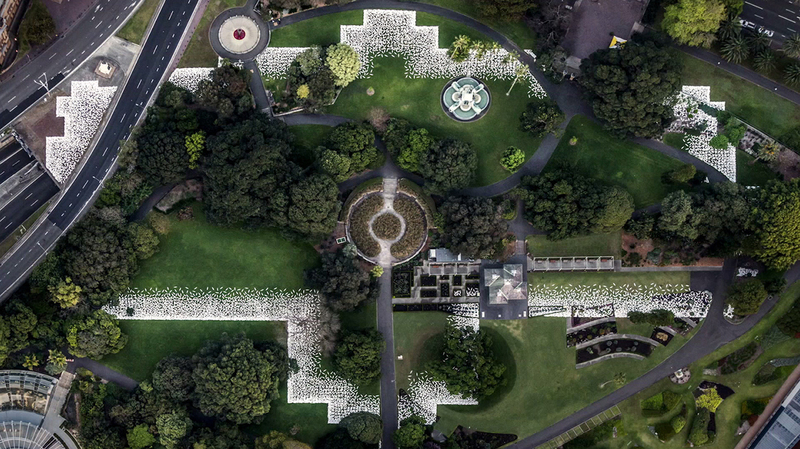 An aerial shot reveals that the grass beds have been planted in the shape of an Aboriginal symbol of two people facing each other by a fire, thereby inviting viewers to participate in a dialogue about invisible histories, shared histories. In the Western academic tradition, the term ‘memory palace’ refers to a memorisation technique promoted by ancient Greek philosophers, in which visualised structures and landscapes in the mind helped scholars store vast amounts of information. In Aboriginal cultures, song-lines and Dreaming stories worked in the same way for thousands of years as internalised maps of memory for ancient knowledge. Rachel Storey’s documentary offers insight into a process by which Aboriginal and non-Aboriginal people together might reclaim and retain cultural and historical memory through a deeper understanding of and connection to place. Hand-held sequences of rapid shot duration depicting the installation process build tension to give us a sense of Jones’ personal investment in his artistic vision. These elements combine to produce the feeling of enthusiastic, equal participation in an intriguing shared journey of historical revisionism, free from grief, guilt or recrimination. The documentary, like the artwork it examines, is a celebration, containing both truth and reconciliation while carefully avoiding a truth-and-reconciliation agenda.